Endurance athletes put a large emphasis on their training programs, their equipment and their nutrition to assure they reach their goals. First Endurance consults with hundreds of these athletes primarily on nutrition and how to best fuel your body for long distance racing. Through these consultations with beginners, veterans, elite amateurs and professionals it is quite clear that carbohydrates and how they should be used is vastly misunderstood. Much of what is misunderstood is likely driven by the media’s generalization of nutrition topics. Often you hear ‘eating too much sugar makes you fat and is bad for you.’ Furthermore clinical data performed on the general population is often extrapolated to endurance trained athletes, who do not fit this category. This has lead to some misunderstanding and misconceptions about carbohydrates. Below are the four most common. 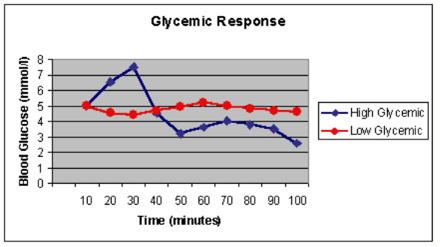 #1 Misconception: Sugars are high glycemic* so they give a sugar high then crash. Generalizing all sugars into the category of high glycemic is false. Some sugars are high glycemic, some are moderate and some are low. Foods also have a glycemic index and many have been measured. The only way to truly know what a foods glycemic index is, is to look it up or have it measured. This is one of the most common misconceptions and is also directly related to misconception #1 & #4. Maltodextrin is one of the highest glycemic index carbohydrates available. Its because its high glycemic load that it actually works so well as a primary carbohydrate in many energy drinks. More specific its because it has a low osmolarity and is absorbed quickly that it works so well while exercising. #3 Misconception: Sugar is bad for my health. What this should state is: Highly refined (empty calorie) high glycemic sugar during rest is bad for my health. Consider that fruits and vegetables and grains are primarily sugar, would one state that adding more vegetables, fruits and whole grain to one’s diet is bad? No. Unfortunately many consumers forget that these highly nutritious foods are almost all sugar. Sugar (as glucose) is the primary fuel that your body and brain runs on. Glycogen is our stored energy source and glucose is our circulating energy source. ALL nutrients, including fat or fiber ultimately get broken down into glucose so your body can run efficiently. Trying to eliminate sugar is like trying to run your car without gas. So what is bad about sugar? Consuming a high glycemic highly refined food when you are hungry causes a sugar high, strong insulin response, then a sugar crash. This ultimately can lead to insulin resistance and diabetes. This also causes consumers to eat more because with each sugar crash they crave more food. Example#1: taking a couple hand fulls of Rice Chex (GI=89), a short time later you feel emptiness (due to the sugar crash) and repeat the cycle. This leads to numerous health problems like insulin resistance, diabetes and weight gain. Lets be clear here that it was not sugar that is the culprit, but a high glycemic choice while at rest**. Now if you added some protein or fat to that snack choice, like nuts or an avocado you have effectively reduced the glycemic index and will not get the sugar high/sugar crash result. Example #2: You choose to have a piece of gluten free wheat bread (GI=90). Sugar high, sugar crash..repeat. Most don’t associate gluten free wheat bread as being a bad choice, but then again most don’t clearly understand the implications of glycemic index. Add a bit of peanut butter to the bread which is primarily protein and fat and you have reduced the glycemic index and hence stabilized blood sugar. In these examples you can clearly see that its not the sugar that is the culprit in bad health, but the high glycemic choice. In both examples you can consume the same amount of sugar, but greatly improve its effect on your health by eliminating the effects of a high glycemic cycle. In the opening paragraph we stated that clinical data on the general population does not extrapolate to endurance athletes. From the misconception #3 you should have learned that high glycemic foods result in a sugar high and sugar crash. This is true in all situations EXCEPT when you are exercising and immediately following. Many athletes have taken what they learn from the media and have concerned themselves with consuming sugar and hence opted for a more sustained energy flow coming from maltodextrin (a complex carbohydrate). This is wrong on three counts. 1) When you are exercising your insulin is blunted. Meaning, that when you are exercising and you consume a high glycemic food, you do not get a strong insulin response and hence you do not get a sugar crash. Your body is very smart and it clearly understands that when you are exercising you want to use the food or drink you consume to fuel your muscles. If insulin kicked in, the food or fuel you consumed would not get to the working muscle. 2) Athletes tend to choose maltodextrin, which is a good choice, but do so for the wrong reasons. As you learned from misconception #1 maltodextrin is actually high glycemic not low glycemic. Hence maltodextrin is a good choice because it is fast absorbing, not because it’s slow absorbing. 3) Looking for that low glycemic, slow sustained energy will actually cause you to bonk prematurely. Some even consider using some fat because they are going long. Understand that we all have about two hours of stored glycogen. Once this runs out, we bonk. If you consume a slow absorbing/low glycemic food while exercising you are forcing your body to rely on its stored glycogen. The entire goal of fueling for long endurance racing is to spare your muscle glycogen. In other words do what you can to hold on to that stored glycogen. The best way to do this, outside of appropriate pace and training, is to consume primarily fast absorbing carbohydrates to fuel your exercise. This will allow you to immediately use what you consume for the working muscle, so you can spare your stored muscle glycogen. The act of consuming slow nutrients can also cause gastric distress. Consider that slow absorbing nutrients spend a lot of time in the digestive system. Doing this while exercising simply backs up the digestive system and does not allow for those fast nutrients to get absorbed. Often athletes cannot understand why they bonked when they consumed a large amount of calories. The simple answer is that they likely consumed slow calories that did not absorb before their glycogen ran out. And often you feel this through considerable stomach discomfort. *Glycemic index is the measure of your blood sugar response following the consumption of food. High glycemic foods result in a sugar high. Low glycemic foods are absorbed more slowly and result in a steady blood sugar response. Adding fat, protein or fiber to any food effectively reduces its glycemic index. Though there are two scales used, the more common scale measures glycemic index from 0 to 100. **While at rest your insulin works efficiently to bring high circulating glucose down. While exercising the body wants the high circulating blood glucose to be driven to the working muscles as fuel. 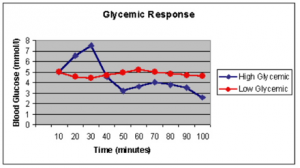 Hence, while exercising insulin is blunted, so eating a high glycemic food does NOT result in a sugar crash. Resent research has proved that during exercise carbohydrates can be absorbed concurrently in multiple channels. Consuming several carbohydrate sources will allow the endurance athlete to better absorb the fuel needed to sustain endurance activity.